Open Space offers beautiful rooms for your needs. From fundraisers, seminars, workshops, to massage, dance, and yoga, the possibilities are endless. We have one spacious room (main studio) with a full length mirror, laminate wood floor, and a natural gas wood stove for warmth and ambiance. The lobby is warm and inviting, making it ideal for art openings, First Fridays, and parties. 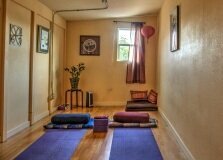 Two smaller rooms are perfect for private audiences, such as counseling sessions, massage, bodywork, or small group trainings.